Ubisoft have been in the news a lot this past year – and for all of the wrong reasons. Assassin’s Creed Unity has landed Ubisoft into the very same internet hot water they’d found themselves in after the massive Watch Dogs graphical downgrade controversy. You might recall the Watch Dogs incident was sparked due to the title (on any platform) looking noticeably different from the E3 2012 demo footage. And indeed, when users found out that editing small config files restores much of this graphical goodness to the PC version, the internet exploded. Now, virtually at the first year anniversary of the release of the Next Generation consoles, users have come to expect the Playstation 4 version of games to possess a resolution advantage over the Xbox One. But, with Assassins Creed Unity, Ubisoft made waves by confirming resolution (1600×900) and frame rate (locked at to 30FPS) parity between the Xbox One and the Playstation 4 versions of the title. By Ubisoft’s own GDC presentation it’s clear that the Xbox One has a slight CPU advantage, while suffering from a GPU disadvantage. But in reality, the CPU’s which power both machines would appear to be the primary limiting factor of the performance. Discussing the visuals of Assassin’s Creed Unity for a moment, the game can look extremely gorgeous. Lighting, geometry and textures are all improved over Black Flag. The art team cannot be faulted for their work, Paris looks damn near postcard worthy. Subtle touches will be noticed, such as standing in a building and subtly moving trees affecting light pouring through the windows. Shadows reflect this perfectly, moving in time to the foliage. The actual cause for the resolution parity is a difficult one to pin down; for all intents and purposes, the game looks very similar across both platforms. Despite the Xbox One version being slightly darker with default gamma values (meaning it needed to be raised by 1 point to be equal to Sony’s platform brightness values), there are only marginal color differences between both systems. This isn’t really a case of different assets, or different lighting – just both systems outputting color slightly differently. it isn’t as pronounced as Call of Duty Advanced Warfare, but still noticeable upon close inspection of various assets. A clear constraint across both platforms are large crowds; due to the difference in CPU time available (that is, the Xbox One’s CPU runs faster, thus can process more data in the same amount of time), the X1 can handle the much larger crowds found in Unity with slightly less sweat and tears. However, the gulf between the Xbox One’s ‘average’ Frame-Rate and the Playstation 4’s appears greater than ten percent, which as we’ve just discussed is the difference between the two consoles clock speed. As an example, near the very start of the game there’s a chase sequence where the Playstation 4’s Frame-Rate dips to 22 FPS (at its lowest) while the Xbox One manages to hold on to around 26 FPS in the very same sequence. The worst dip we’d seen took the frame rate of the PS4 version all the way to 17 FPS, which is frankly, terrible. This was caused in the cathedral area, with a lot of geometry, smoke bombs going off and in the midst of fighting a rather large crowd of angry guards. The Xbox One version did manage to fair slightly better, holding on to the low 20’s for dear life. The strangest part of all this however are the cutscenes; which have a lower frame rate on the Xbox One compared to that of Sony’s machine. It does appear that particle effects (and other GPU intensive effects) can take a little more out of the X1, but for the most part it still maintains better performance. Regarding overall image quality, the picture does suffer some at the hands of the lower internal resolution of both consoles. Despite the Xbox One and PS4 possessing fairly robust image scalers, they’re not able to ‘make up’ detail of the missing pixels. Both consoles have the same internal resolution: 1600×900, and at times it can show. Unfortunately, the consoles are using a rather basic post process Anti-Aliasing (likely FXAA) and it can look rather ugly. White ‘borders’ can pop around objects such as picture frames and even architecture. Worse still, the lower resolution and AA problems can of particular problem when it comes to finer details (such as swords, rope and hair). It’s a problem many console games suffer from, but the effects are certainly more pronounced in Unity. It’s a bit of a shame, after we’d enjoyed SMAA on Assassin’s Creed Black Flag. It would appear that there’ very little difference in the assets used in either version of the game. Both versions stack up pretty closely to each other, and there’s no major differences in say, texture quality, which are present in many titles – such as CoD or Tomb Raider. In those games, the PS4 version typically benefited from additional Anistropic Filtering (AF) which helps improve the clarity and quality of textures. Even the shadows appear interchangeable in image quality. So, for all intents and purposes, the two versions are visually identical. While the title does look fairly beautiful, certain assets still look a little ugly – trees and foliage are certainly not up the quality the houses exhibit. It’s possible the overall complexity of these models was reduced to help give the CPU and GPU a bit of a break. Foliage isn’t the easiest thing to render in the first place, let alone when the developers were clearly concerned over render and CPU time. Possibly another reason why so many characters have such short hair (also very taxing on the CPU). The biggest problem with the graphics are the glitches. While Ubisoft assure us there are patches in the works, the glitches range from ‘slightly annoying’ to massive problems with Alpha channels. When recording our initial thoughts on AC Unity, near the end of the video we ran up and down one a street to demonstrate the ‘pop in’ of characters. There are huge problems with LOD. Typically in games, textures, geometry and characters phase in with different Levels of Detail. The further they are away from the camera, the lower the LOD can be. Assassin’s Creed often has objects completely ‘pop in’ from one step to another. And it’s not subtle. NPC’s can literally appear in your way. Compounding this rather frustrating problem further still, is that characters sometimes change models. For instance, a woman can be wearing a white dress and have face A. Two steps later, she’ll be wearing a red dress and have a totally different face. This isn’t a simply LoD change, this is a totally different character. The strain of carrying out so much AI at a time is also evident with how NPCs react. Path finding is pretty suspect; often NPC’s will quite literally walk into you even if you’re standing still. Just as frequently, they’d ‘slide’ across the ground a few steps to get into better position. You’ll also see other examples were they’ll walk across tables, or even get stuck on geometry. Speaking of geometry – clipping through it is a big problem. Small problems like your foot ‘sinking’ ankle deep into a roof (this is particularly true of acutely angled surfaces as a whole) all the way to grabbing onto the edge of a wood cart. That is an invisible edge, that’s at least a foot away from visible model. Similarly, NPC’s can clip through walls (particularly dead bodies, but that’s a pretty common problem). Clipping can (and frequently does) extend to problems during combat, with enemies blissfully ignoring your anguished cries as your sword passes straight through them. This is exacerbated still further when one takes the wild frame rate into account. Input latency can be a real factor in the game, and if the frame rate happens to dive at the same time, your pleas to counter the enemy will be answered with a sword in the throat. A frame rate of low 20’s can add at least 10 – 18ms of latency on the controls. Now we’ve got our hands on the final retail release, it brings up more questions than it provides answers for. Prior to the titles release, there was concern as to the reasons of parity. Now we’re testing to the title out, it’s hard to not feel that the game hasn’t had the optimization and bug fixes that it needed. Both console platforms have their myriad of issues, and though the Xbox One is currently proving to be the ‘smoother experience’ it’s a pretty hollow victory. The fact the Xbox One performs better in gameplay, while the PS4 is better inside cutscenes is certainly. While there’s certainly likely scenarios – little optimization on either console version, cutscenes possibly requiring less CPU time rather than GPU, while during the game itself, the extra CPU time (to dispatch draw calls to the GPU) the Xbox One shines. But it’s a lot of speculation, and without the ability to see Ubisoft’s development tools and looking at engine load and knowing how clean and optimized their code is, it’s only that; speculation. 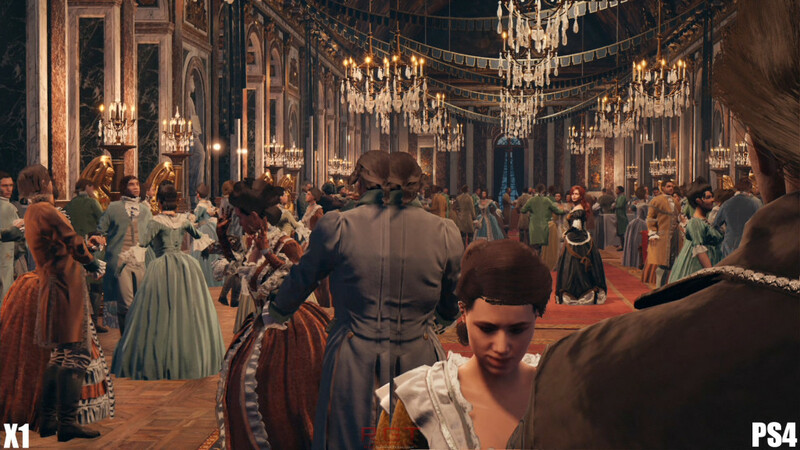 It’s hard to recommend buying AC Unity as is. For one, it’s hard to justify giving Ubisoft cash for this work – it’s not up to the quality of a AAA developer, let alone for a series as beloved as AC. Furthermore, which version actually ends up to be the ‘best’ is anyone’s guess. If you really must play the game here and now, then the Xbox One version is your best bet. But it’s not without faults and issues. 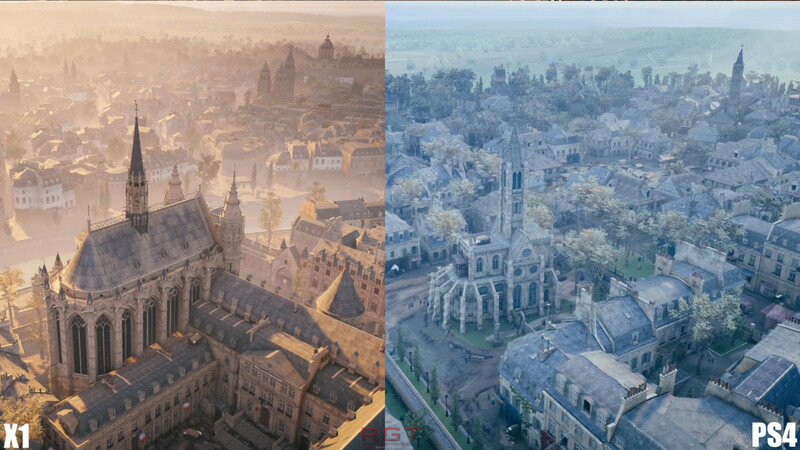 A graphics comparison of the playstation 4 vs Xbox one and frame rate testing of AC unity.